The new Strike Force HD Pro camera from Browning packs great promise and shows the continued growth of the Strike Force series. It is the third installment in the Strike Force series and the second release this year. The previous Strike Force HD Elite (2016) and the Strike Force HD 850 that came in early 2017 each with solid reviews. The new camera is packed with many great features, improving on its parent model. The HD Pro would be a good choice for shooting daytime photos, and especially daytime videos in high definition. All this goodness comes at a mid-range, yet affordable price that is more than fair considering its specs. 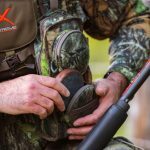 The Strike Force Pro has a familiar compact case design. The brown and orange camo with textures and leaf patterns is easy to conceal. Browning also included an adjustable metal bracket on this model that can be used to adjust the camera up to 30 degrees up and down. The latch on the door appears to be redesigned this year. It’s smaller, but still securely cover the bottom part of the camera. Opening the door, you’ll find the on-off slider switch, four-way directional keypad, mode key, and a color LCD viewing screen. You can see 5 lines of menu at a time, and view pictures. The keypad makes for easy navigation and are backlit at night. The menu is easy to navigate, and the data strip contains a lot of useful information such as the temperature and moon phase. There is a convenient SD card management option that allows the camera to overwrite the oldest content in the SD card in case it gets full or you forget to erase its contents before starting. 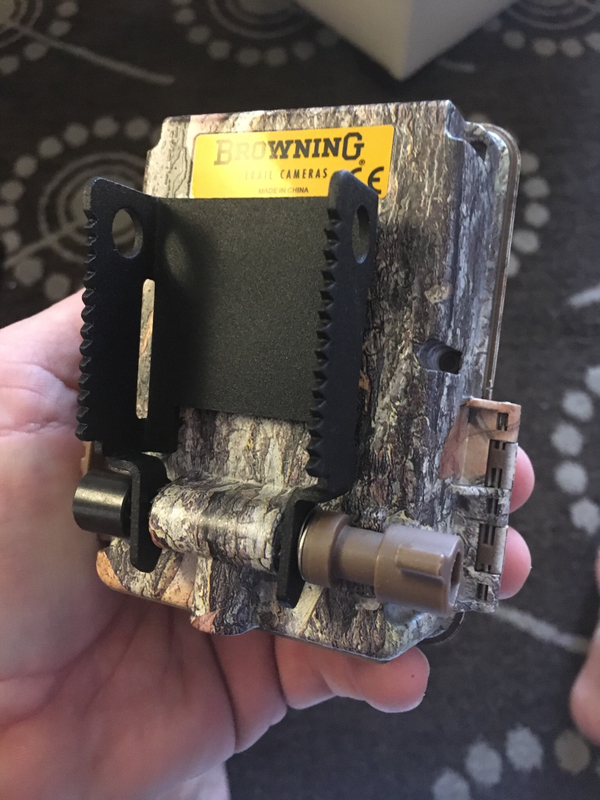 Browning has added a nice metal mounting bracket with this camera. It pivots on a knuckle on the rear of the housing, and the toothed side clings to the tree. It will only face out or tilt downward, but it is a convenient add on and nice touch for a camera of this price. The trigger speed on this camera (0.3 seconds) is exceptional and shows a great improvement over its previous model. The Strike Force Pro also has a great video trigger time (<0.5 seconds) and recovery time. The picture recovery time is also exceptional, although some tests show that the camera has a glitch on every 8th trigger which causes it to record a much slower time. The detection range goes out to 100 feet, but is narrower than the field of view. The result of a design like this, which is creative, is a lower likelihood of false triggers. The Strike Force Pro has an excellent color depth that is a vast improvement from the previous Strike Force 10 MP camera. During daytime, the camera manages to produce consistently high-quality images even in varying conditions. However, since the 18MP camera is interpolated, you are likely to see some pixeling when shooting photos at the maximum resolution. This small issue does not undercut the cameras richness in color depth and clarity of images even with fast moving wildlife. The nighttime pictures also show outstanding quality with the extended flash range of 60 feet allowing you to capture images on a wide radius. Browning included new IR emitters on this camera, and they are proving to be a significant boost to its nighttime flash range. The Strike Force Pro can also adapt to up-close shots in the night so that the picture has clarity instead of the white out normally experienced on other cameras. The videos show improvement in quality and color depth. The 1296 by 720 resolution videos with audio provide sufficient clarity for regular use. Although this resolution cannot be considered top notch based on the current standards, it is still good quality for a game camera since it also preserves battery life. At night, the camera has a consistent flash range that produces top grade videos. The cam has a special Timelapse Plus feature that lets you record time lapse images at predetermined intervals. The time-lapse mode does not interfere with the detection shooting as the camera will still capture the motion detected images. Browning also provides special software for viewing and analyzing the time-lapse pictures called the Buck Watch Timelapse Viewer. The camera also has a Smart IR video detector that allows it to continue filming up to a maximum of five minutes during daytime as long as it continues to detect motion in its field of view. The battery life on the Strike Force Pro is truly exceptional, with some reviews even terming it as the best in the market. According to TrailCamPro the picture power consumption is a little over 2 watts during daytime and 3 watts during nighttime. Video draws a little over 12.5 watts during the day and a hefty 36 watts at night. On an average use of about 70 pictures spread evenly between day and night, the batteries would last almost a year. Lithium batteries are the best for achieving this long life although you can also use rechargeable batteries or use an external 12V D.C. power source. Capable of very good image and video quality. Exceptional battery life that is arguably the best in the market. Fast video detection and picture trigger speed. Comes with a nice metal mounting bracket. Only records night videos to a maximum of 20 seconds. Glitch on the picture recovery time, causing recovery delay on every 8th sequence.